Today we present French painter Jean-Antoine Watteau (1684-1721). He lived only 36 years, died from tuberculosis, but left a poetic legacy: “gallant scene”, touched with irony and subtle lyricism, imbued with grace and harmony. Jean-Antoine Watteau was born in the province in a poor family. To Paris he came on foot and began working in the theatre, always drawing from nature, and have not received professional education. The formation of Watteau as a painter refers to 26 years, and the flourishing creativity – to 32-m. we Must remember that after 4 years of his life cut off disease. Contemporaries not simply appreciate the paintings of Watteau. AntoineJean caused them delight. This sweeping success can be attributed to the fact that the painter is different look at the “gallant scene”, which by this time was known. 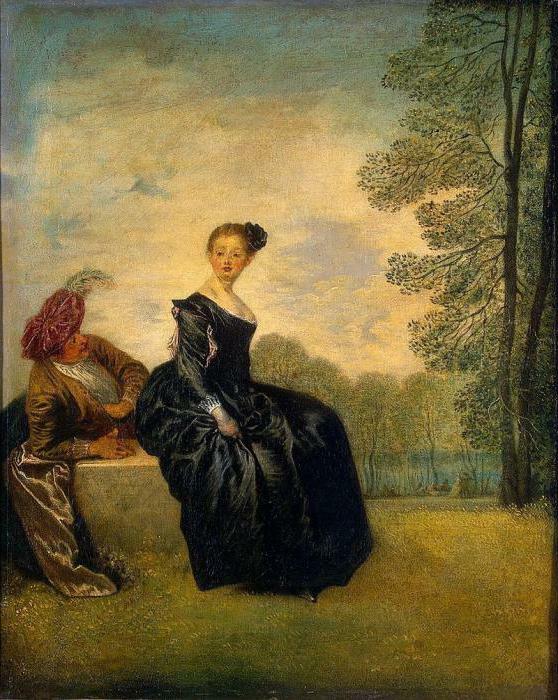 The paintings of Watteau, AntoineJean wrote not just as a celebration of art and love. He invested in them a depth that was inaccessible to his followers. As time passes, his work will be forgotten for a long time. 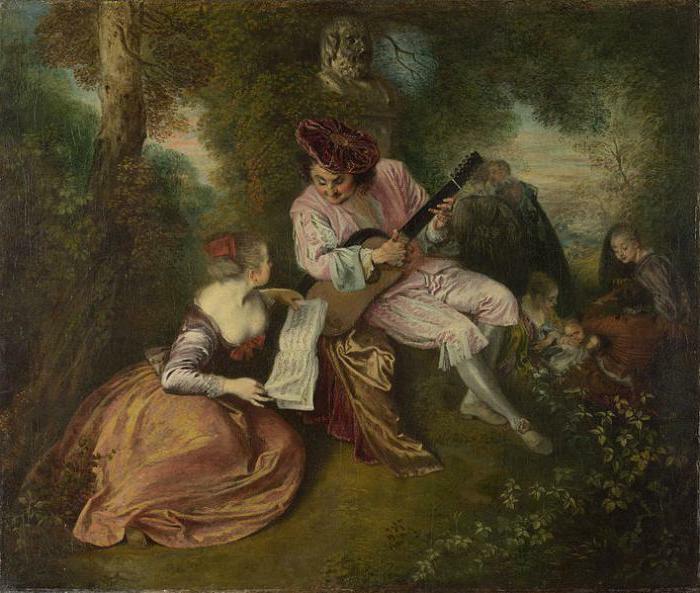 The poets of the nineteenth century will reveal paintings of Watteau. AntoineJean will be especially appreciated by Baudelaire, Verlaine. He will dedicate a poem by T. Gautier. The brothers Goncourt will assume that the paintings of Watteau, Antoine wrote, creating poetry and dreams. 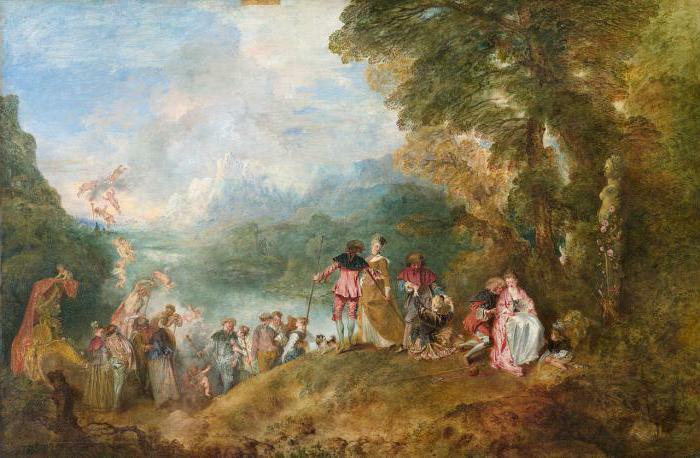 Inspired by the painting of Watteau, the composer Debussy has created a piano piece based on the painting wizard “Pilgrimage to the island of Kythira”. 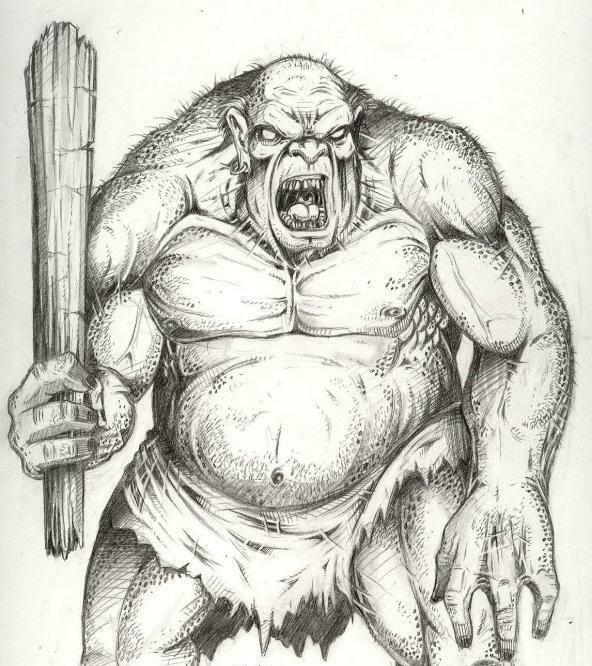 the Art of being pleasing in society was embodied by the painter in the above mentioned work. 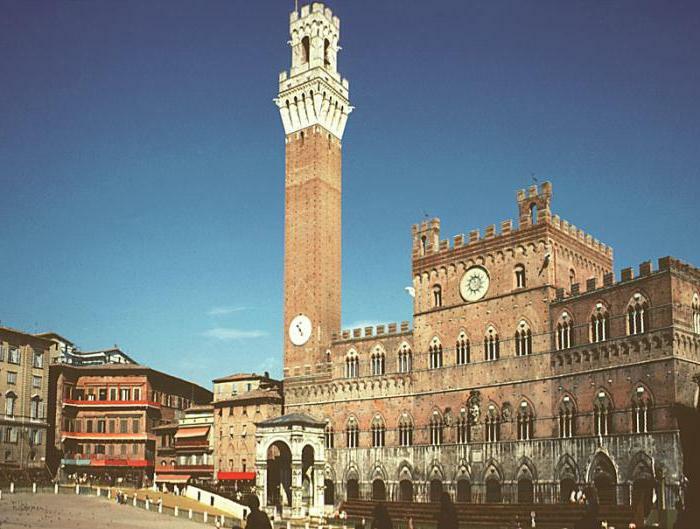 Elegance and refinement distinguish the “Pilgrimage…”, which was established in 1717. Puzzle for researchers is the return of that island or sail to it. At the foot of the statue of Venus, a young woman hears compliments about her Beau, who stands before her on his knees. In the next couple of impatient companion delivers the hands the lady who was still sitting on the ground. The third pair is worth. The lady turns back around and sadly looks at the place where she was happy. At the feet of her companion is a dog, which represents loyalty. The rest of the group with jokes and noise down to the gondola, which floats on the water like Golden dream, entwined with garlands of flowers and of crimson silk. 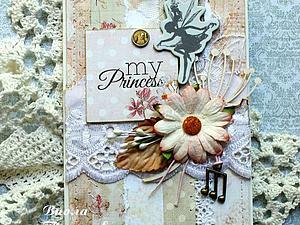 The colour made up of warm pink and Golden tones, which are complemented by green and blue. In the same poetic manner “gallant scenes” was played by Jean-Antoine Watteau paintings with titles: “a Difficult situation” and “Caprinica" (GE), "Lesson of love”, “between the trees”, “the Society in the Park”, “Love song" of the Venetian festival”. 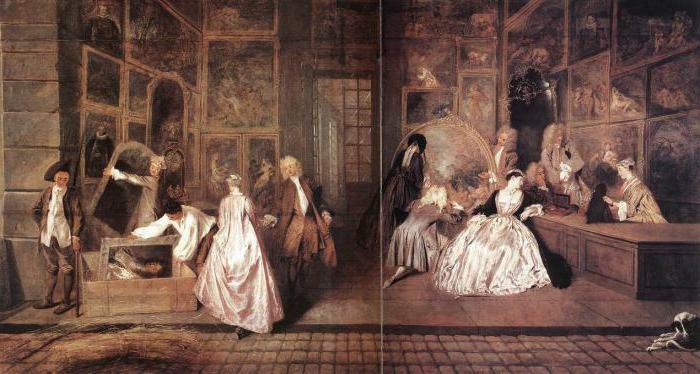 it is located In the famous work of Watteau, written in 1717, – Le gamma de l'amour. the Diagonal composition draws attention to major figures in the foreground: girl in the lush dress of iridescent taffeta, shades of which, barely touching the brush to the canvas of the painter. Highly lifted hair elegant open neck model. The notes in her hands – just an excuse to her companion were free to look into the low cut corset, riffling the girl and yourself a gentle Serenade and a not less passionate opinions. Placed simply above them the bust of the philosopher, which does not interfere into each other pair. As not care about the other characters of the second plan. The centre decided in rose-gold tones that stand out against the lush Park greenery. In gallant genre scene “Caprinica” to distract attention from the two characters: the young girl and her experience of the satellite. The model is in hesitation, take offense at too Frank speech of the gentleman and leave or stay to listen to his compliments. She pouted and chooses a full skirt. Her companion located imposingly behind her back and not committed to persuade her to stay. Highly experienced, he knows that the next meeting was inevitable and would lead to the surrender of this young creation. Jean-Antoine Watteau paintings fills not only the poetry, and subtle penetration into the spiritual world of their heroes. In 1720, absolutely sick artist I wanted to write a sign for an antique shop my friend Gers, but she was always the only painting, which reverently treated. This is the last masterpiece that Watteau wrote cold, dead fingers. the Canvas is made up of two parts, totally different from all previous works. Is to work with the interior of the store, not with nature. Front wall “removed” the artist and the viewer sees what is happening in the boutique and also cobbled Paris street. Three walls from top to bottom hung with paintings of various sizes. In the foreground of the seller carefully placed in a wooden box portrait of Louis XIV, who died recently. A portrait of his kinsman, king Philip IV of Spain, hangs high in the left corner. The second part is buyers who are considering using binoculars details of the huge paintings in the form of an oval. The paintings on the walls are still lifes, landscapes, mythological scenes. Perhaps the intent of the artist was to represent the whole history of painting and its variations as an artist, which in recent times dreamy and sad looking back on those years. We examined a small part of the paintings, which were written by Jean-Antoine Watteau. Famous paintings of the painter are in all major museums of the world.